The Carl T. Johnson Hunt and Fish Center, located in Mitchell State Park, is named for the founder of the Michigan Conservation Foundation who is a life-long supporter of hunting and fishing. The center is universally accessible. The spacious lobby features an information counter, marsh diorama and wall-size aquarium stocked with native Michigan fish. The center was constructed by the DNR with financial assistance from individual donations and from the Rotary Club of Cadillac Foundation. The center offers group tours and guided hikes which explore the 2.5-mile Heritage Nature Trail leading through the woodland and Heritage Marsh. The nature trail is a study area that supports a variety of plants and wildlife. The trail, mostly a woodchip path with bridges and boardwalks, provides an easy hike around the wetland areas. The trail has interpretive panels along the route that offer interesting facts about the plants, animals and other natural features. An elevated observation platform overlooks the entire wetland area. A small fishing pier and a barrier free observation platform also improve the visual and physical access to this beautiful marsh. 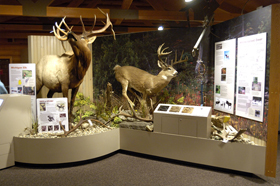 A full-size Michigan elk mount is on display in the exhibit hall, as well as other wildlife species which have been “brought back” by the efforts of sportspersons’ organizations. With the push of a button, visitors can hear the call of the elk or other species featured in the wildlife exhibit. Other exhibits outline the progression from the first hunters to the present day. A conservation time line reveals the rise of sportsmen and sportswomen and their contributions to more than 150 years of Michigan history. The respectful and harmonious relationship between Native Americans and nature are illustrated with a full-size black bear. An audio message interprets the scene as the viewer approaches the case. Authentic replica leather clothing, bows, arrows, and quivers adorn the figure and can be seen in other display cases. 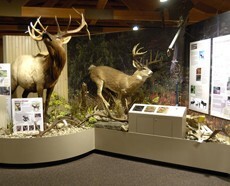 Within the center is an auditorium are exhibits showing the role sportsmen and sportswomen have had in preserving and restoring Michigan’s wildlife and fisheries resources. Hunter education classes are frequently offered at the Center, held in the auditorium and the outdoor archery and pellet gun range.